This weekend project I wanting to really work on some thing that required a lot of work. I figured I would dig thru the slowly diminishing stash and see what I had… I found these 4 orphan blocks they measured 16″ so will .finish out at 15 1/2″. Most of the materials and blocks for this quilt were given to me from my friend Sue and her daughter Anne. they did not come all at once I think I got this over the last year and a half. Now the fun part what was I gonna do with this to make a decent charity quilt? On point always ends up larger with the least amount of blocks. Since I already had some squares pre cut I thought I’d work with a 9 patch block, using a 9 patch for the smaller sections and a solid the same color of dark brown as in the main fabric. Now the math part I needed this grouping to end up being 15 1/2″ when finished. I’m so glad that I have the Eq7 program to do that part for me. This is the quilt I worked up in the program. It turns out that the small squares are to be cut at 2 1/4″ and the large squares were to be cut to 5 5/8″ I just rounded up to 5 3/4″. Once I was finished the center block I had to work for with the HST (half square triangles) and QST (quarter square triangles) blocks surrounding the 5 center squares. so each small HST is to measure to 2 1/2″ + 3/8″ = 2 7/8″ wich I rounded up to 3″. Once I had all the blocks finished I went to sew them together and Oops!!! I was 1/2″ short on the Kaleidoscope blocks. Ok to add 1/2″ I needed to add 1/4″ on all sides so I cut strips to 3/4″ to make room for the seam allowance. This mess up actually ended up giving my quilt what it needed to give it zing. I pulled on the lime green from the focal. 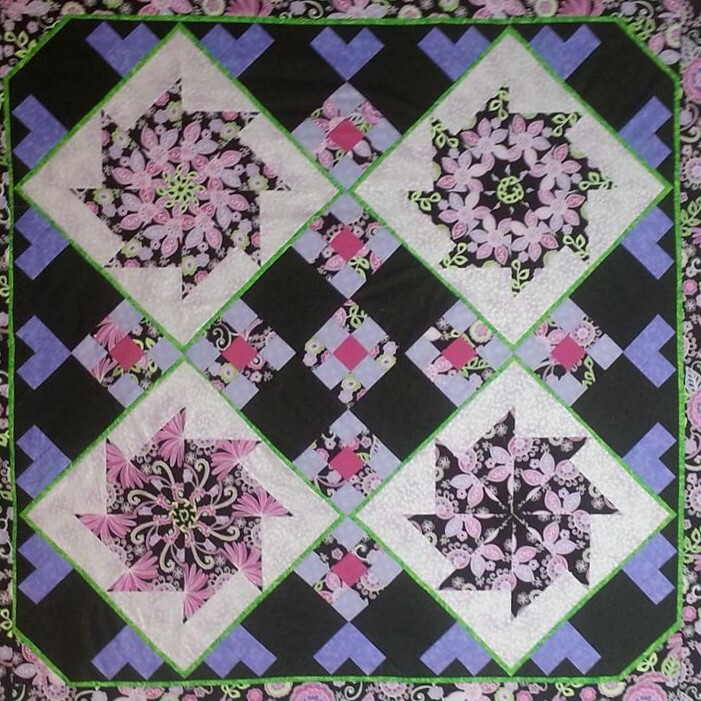 I decided instead of working with a square for the border I would with the cut off angels on the corners then do my sashing with the focal fabric. I’m so happy how this quilt turned out. It measures out at 47″x47″Can’t wait to get my long arm so that I can start practicing. Previous 1st quilt on a long arm… Lots of lessons learned. Wonderful job Renee and I will most certainly pass this on to Pam, she will be so pleased to see what you have done with fabric from her stash, Sue. Ill soon be posting a bunch more quilt tops that were made from Pam’s blocks. It turned out beautifully. It is an amazing charity quilt. Thanks Ariane, I hope it gives someone some sunshine when they get hugged by it. thank you. I enjoy sharing with others. Wow! That came out so cute! I love EQ7. That has helped me so much with layouts.